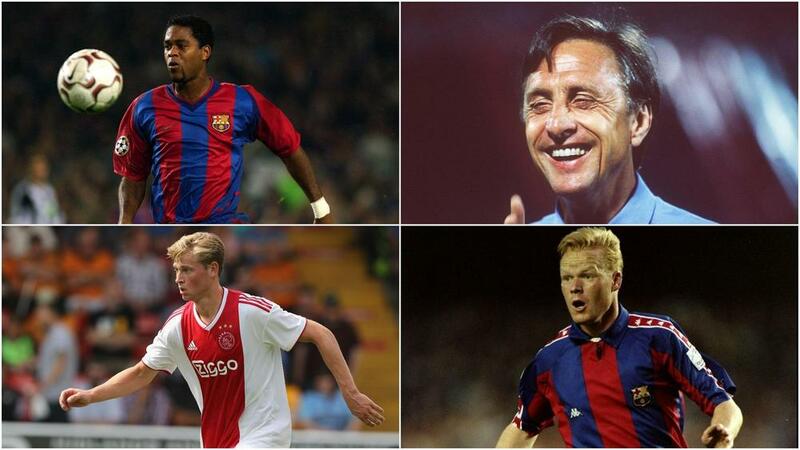 Frenkie de Jong will be following in the footsteps of a pantheon of Dutch legends when he links up with Barcelona from Ajax at the start of next season. The much sought-after 21-year-old midfielder ended speculation on his future by agreeing to join LaLiga's champions on a five-year-deal from July in a move that could eventually rise to €86million. De Jong will get to develop his burgeoning talent at a club that goes hand-in-hand with Dutch greats, with 19 previous players from the Netherlands having represented Barca. Some were more successful than others, with the likes of Edgar Davids and Ronald de Boer among the more illustrious names to have not quite enjoyed their best successes at Camp Nou. But below we take a look at the five greatest Dutchmen to don Barca's famous colours. It is impossible to start this list in any other than with the legendary Johan Cruyff, a man so synonymous with Barcelona. Like De Jong, Cruyff joined from Ajax, winning LaLiga and the Copa del Rey during a five-year playing stint. The graceful forward would return to Camp Nou as head coach, winning four LaLiga titles, a Copa, a Cup Winners' Cup and a European Cup with his "Total Football" style in a golden era for the club. A player whose grace and artistry made him so adored by fans, Johan Neeskens' career trajectory took a very similar path to Cruyff's. While trophies may not have arrived with such regularity as they did at Ajax – just one LaLiga and one Copa trophy in five years – Neeskens is considered one of the best Dutch midfielders of all time, reaching the World Cup finals in 1974 and 1978. Renowned for his composure on the ball, the now Netherlands manager was a class act capable of operating in defence or midfield. Having also played for Ajax, Koeman arrived at Barca from PSV to play for Cruyff and was a lynchpin of the team that accumulated so much silverware. Described by former coach and compatriot Louis van Gaal as the "perfect striker", Patrick Kluivert certainly lived up to such a billing at Camp Nou. The powerful striker scored 145 goals in 308 games during a prolific six-year spell at Barca. His only major honour during that time was the 1998-99 LaLiga title, but Kluivert remains a popular figure among the club's fanbase. An uncompromising and classy defender, Frank de Boer arrived at Barcelona in January 1999 having previously won the Champions League as part of the legendary 1994-95 Ajax team that also included fellow Barca alumnus Michael Reiziger, Davids, Marc Overmars, Winston Bogarde, Kluivert and twin brother Ronald and coached by Van Gaal – the man who brought him to Barca. He made 112 appearances for his country and featured just shy of 150 times in LaLiga for Barca, who he won a league title with.